What I usually do to get around this is to map that directory to a network drive and then I could easily access it from the command prompt. But is there an easier way on how to get around this? 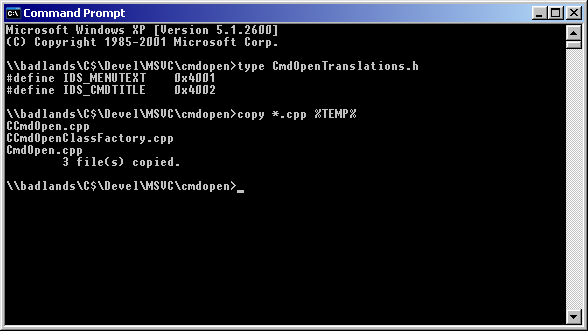 If you use pushd and popd instead of cd you won't get that UNC error. pushd <UNC path> will create a temporary virtual drive and get into it. popd will delete the temporary drive and get you back to the path you were when you entered pushd. I use Git Bash to do this, since I already have it installed. Kliu's "ContextConsole Shell Extension" (aka Open Command Prompt) says it, "can even open directories from network paths (UNC paths)" (from an Explorer window). Not the answer you're looking for? Browse other questions tagged windows command-line network-drive unc or ask your own question. 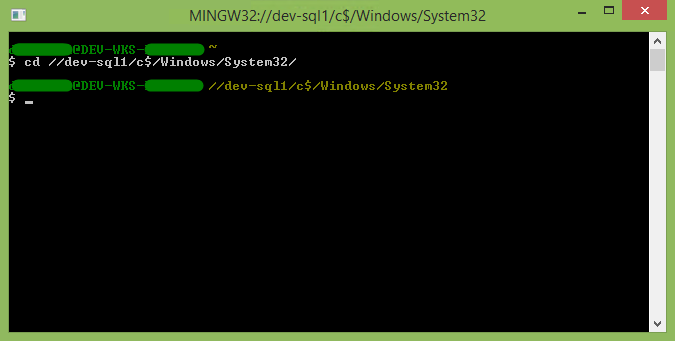 How to open Command Prompt in a specific folder as Administrator? Change user without mapping a network drive? How to rename files located on a network path (UNC path) in Windows 7 command prompt? why doesn't %CD% work after using pushd to a UNC path?